William II of Sicily - SICILIAN POWER! Quote Reply Topic: William II of Sicily - SICILIAN POWER! William II (1153 - 1189), king of Sicily, was only thirteen years old at the death of his father William I when he was placed under the regency of his mother, Marguerite of Navarre. Until the king came of age in 1171 the government was controlled first by the chancellor Stephen of Perche, cousin of Marguerite (1166-1168), and then by Walter Ophamil, archbishop of Palermo, and Matthew d'Ajello, the vice-chancellor. William's character is very indistinct. Lacking in military enterprise, secluded and pleasure-loving, he seldom emerged from his palace life at Palermo. Yet his reign is marked by an ambitious foreign policy and a vigorous diplomacy. Champion of the papacy and in secret league with the Lombard cities he was able to defy the common enemy, Frederick I, Barbarossa. In 1174 and 1175 he made treaties with Genoa and Venice and his marriage in February 1177 with Joan, daughter of Henry II of England, marks his high position in European politics. To secure peace with the emperor he sanctioned the marriage of his aunt Constance, daughter of Roger II, with Frederick's son Henry, afterwards the emperor Henry VI, causing a general oath to be taken to her as his successor in case of his death without heirs. This step, fatal to the Norman kingdom, was possibly taken that William might devote himself to foreign conquests. Unable to revive the African dominion, William directed his attack on Egypt, from which Saladin threatened the Latin kingdom of Jerusalem. In July 1174, 50,000 men were landed before Alexandria, but Saladin's arrival forced the Sicilians to re-embark in disorder. A better prospect opened in the confusion in Byzantine affairs which followed the death of Manuel Comnenus (1180), and William took up the old design and feud against Constantinople. 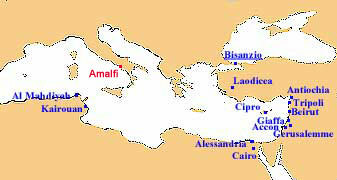 Durazzo was captured (June 11, 1185) and in August Thessalonica surrendered to the joint attack of the Sicilian fleet and army. The troops then marched upon the capital, but the troop of the emperor Isaac Angelus overthrew the invaders on the banks of the Strymon (September 7, 1185). Thessalonica was at once abandoned and in 1189 William made peace with Isaac, abandoning all the conquests. He was now planning to induce the crusading armies of the West to pass through his territories, and seemed about to play a leading part in the Third Crusade. His admiral Margarito, a naval genius equal to George of Antioch, with 600 vessels kept the eastern Mediterranean open for the Franks, and forced the all-victorious Saladin to retire from before Tripoli in the spring of 1188. In November 1189 William died, leaving no children. His title of "the Good" is due perhaps less to his character than to the cessation of internal troubles in his reign. The "Voyage" of Ibn-Giobair, a traveller in Sicily in 1183-1185, shows William surrounded by Muslim women and eunuchs, speaking and reading Arabic and living like "a Moslem king." If you guys like it, tell me and I can post more on this thread! im a very distant relative of roger, the first norman/sicilian king, mainly through relatives in normandy though. "behold, vajik, khan of the magyars, scourge of the pannonian plain!" That's actually fascinating. I wish I could find a famous Italian I was related to! Ah nationalism. I would not say it is Sicilian power as much as it was a branch of Norman power. By saying Norman, you would also be saying it was a branch of French, or even Scandinavian power. Whoo boy, here come the flames. True peace is not the absence of tension, but the presence of justice. Agree with Belisarius. This is more Norman power, than Sicilian. Calling it Sicilian with capital letters is a bit like calling the German Order "Latvian Power". William the Good was also one of the last Hauteville kings of Sicily, since his illegitimate successor Tancred was defeated by the German Hohenstaufens (by precise to Heinrich, son of Barbarossa, who had married himself into the line of succession). And what about the Corleones? An nescite quantilla sapientia mundus regatur? The "Voyage" of Ibn-Giobair, a traveller in Sicily in 1183-1185, shows William surrounded by Muslim women and eunuchs, speaking and reading Arabic and living like "a Moslem king." becasue Muslims were more cultivated back then, as i stated in another thread, Sicily was the most advanced part of Christian europe, Muslims and Christians enjoyed a peaceful co-operation under the Hauteville and Hohenstaufen rule, but it was ended by the Anjou conquest and also under the later Aragonese rule it disappeared unfortunately, but Italy in general remained the cultural spearhead of the Christian european world, ultimately triggering the renaissance. I'd like to add to the above that Sicily had been in the hands of the muslims since the 9th century when the Normans conqured it in the 11th, and the Muslim population descended from the Arabs that had immigrated under that period. I'm sure Temujin MEANT to say that Muslims were more cognisant of the scientific world and were more advanced in the areas of literacy, mathematics, geography, etc than their Christian cousins in Northern Europe who were cloaked in the shadow of the Middle Ages. That said, even in Mediveal times Christians were able to progress--case in point castle defenses evolved from oppida (hill-forts) of the Iron Age to Motte and Baileys to stone-curtain walls suroounding acres of land riddled with emense and intricate earth and stoneworks. A great example of Norman-English castle building can be found at Carphilly Castle, located abou 15-20 miles north of Cardiff, Wales. Truth is a variant based upon perception. Ignorance is derived from a lack of insight into others' perspectives. By the time William came to the throne, the Normans have by far been assimilated and Sicilianized. The kings even had Italian wives. Besides, they spoke in Latin in their courts. And their troops were Sicilians. Actually, I believe the [early] Norman rulers of Sicily separated themselves quite rigidly from the populace, taking French wives and speaking French, and did not assimilate to create one single unit like the fusion of Normans and Saxons into English. This of course, also had the result that the Normans made little cultural impact on the land (as opposed to the French influence on English). The conquerors were quite lax with enforcing their believes (the Papal office was quite unhappy with how freely the Muslims and Jews could practice their religion) or language on the populace, except the Norman feudalism system. Add to that the non-existance of a single Sicilian nation since the island was populated by a mish-mash of Italian, Greek and Muslim peoples, as well as a number of Frankish immigrants - each keeping to themselves, speaking their own languages. I honestly do not know when you can start talking about a single Sicilian identity, but it's most certainly after the time of the Hautevilles. It is an interesting question whether or not the later Hautevilles - William II for example - still called themselves Normans though. The court languages, ie the languages on decrees and other documents, were Latin, Greek and Arab, but they still spoke French. edit: BTW, could you direct me to a site telling about the troop composition of William? I don't mistrust you when you're saying they were mostly natives, I'm just interested.